The coach of my first Henley-winning rowing crew said to us during the lead-up to the race, “You have to be good enough that you can have a bad day on race day and still win.” For me that thought sums up my race in South Africa – not that I won anything, but I did what I needed to do by securing my place at the Ironman World Championships in Kona later this year. 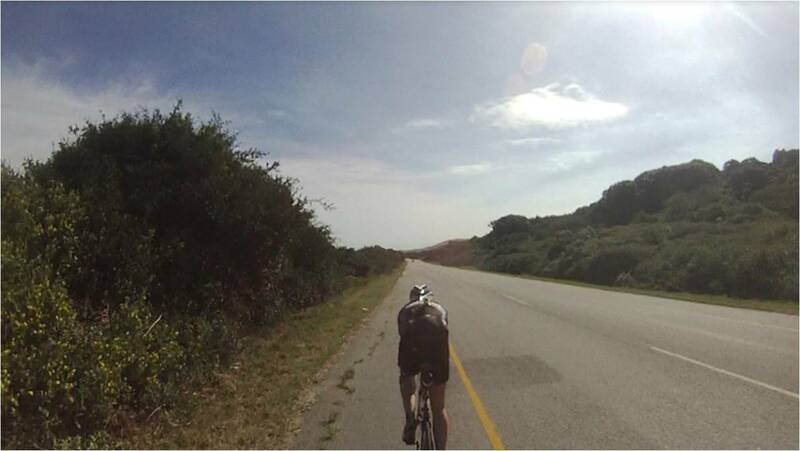 It’s taken me 5 weeks and the perspective gained from a later, more successful race to be able to write a constructive report about my (under)performance in Port Elizabeth. As in all races, there are plenty of things I did right, plenty I could have done better and many observations worth noting for the benefit of anyone planning to race IMSA in the future. 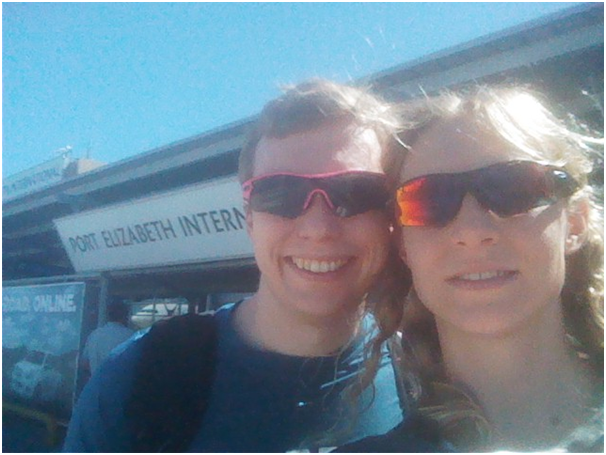 We flew to South Africa a week before the race, aiming to give ourselves time to recover from the overnight flight to Johannesburg and transfer on to PE, as well as to acclimatise to the heat a little, coming as we were from a UK winter. I’d be keen to travel at least this early were I to be racing again. As well as fitting in two pre-rides of a full loop of the bike course each during the week, I was able to work effectively at our hotel; I was pleasantly surprised to find that the internet connection was virtually indistinguishable from a superfast UK broadband connection, which I need in order to work. Working during race week isn’t for everyone, but I find it helps me relax and maintain a sense of perspective. Much had been made of the new bike course (changed from a 3-loop course in 2013 to a 2-loop course to accommodate an increased number of athletes) and how hilly it was. Having been lucky enough to spend two 2-week blocks training in Lanzarote this winter I still perceived the ~1,600m of climbing in 177km as “basically flat”. The course was also an absolute pleasure to ride. The roads were like polished glass compared to the potholes of Surrey, traffic was light and the surroundings beautiful. We even spotted a pod of dolphins out to sea while stopped on the coastal road to execute the Magnum-based refuelling strategy I’d adopted during my second Lanzarote camp of the season. My greater concerns were a shallow beach start (run, jump, run, jump, run, jump, still not deep enough to swim…) and choppy water, as well as how I would hold up running more than twice as far as I’d run in recent training. A few practice swims and short runs in race week didn’t provide much of an idea of what the day itself would be like. 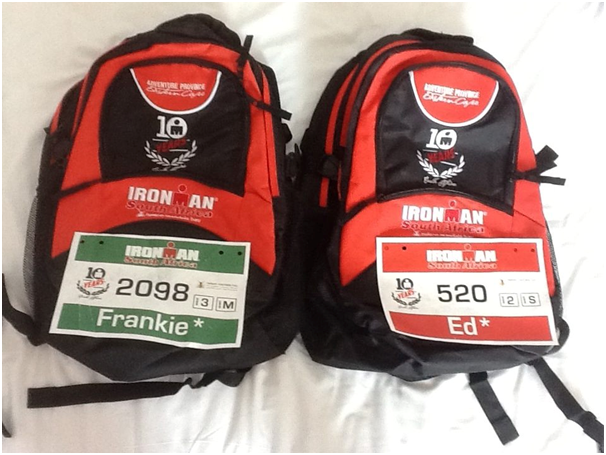 Race number pickup, the expo and briefing were all fairly unremarkable, though it being the 10-year anniversary of IMSA we did find ourselves in possession of some rather smart backpacks! Race day came round quickly but I felt happy that I was ready. I hadn’t raced since Kona, which itself hadn’t really been a proper race due to injury, and I was looking forward to testing the improvements I’d made over the winter. The hotel laid on a great race day breakfast at 4am for all Ironman competitors – and on the subject of breakfast I have to mention my equal measures of amusement and dismay at seeing someone order an egg white omelette, cooked without any oil, both the day before and the day after the race. I mean…. why would anyone want to eat the bit WITH ALL THE NUTRIENTS IN? Ed and I walked to transition together and worked together on our bikes, making sure everything was prepared, then headed over to drop bags and warm up. 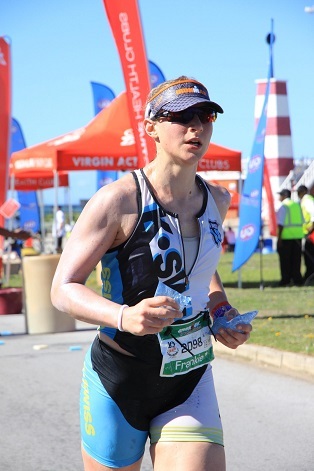 We had to say goodbye at that point – obviously in their infinite wisdom the race organisers decided that women are all slow, and should start at the back, so I had an extra 20 minutes to wait before hurling myself into the ocean. The flip side of starting in a women-and-older-men-only wave meant that we had a slightly less aggressive jostling-for-position-on-the-start-line phase than I am used to, and I was able to start right at the front of the group, without even being pushed, shoved or kicked… After standing on the beach for what felt like forever, the gun fired and we were off. The swim was busy until the first turn buoy 300m from shore, but nothing like as bad as I’d been expecting. (Another aside here for potential future IMSA competitors…. I’ve heard the first starting wave was a slightly different story!) It was only after that that things started to get tricky, with marker buoys over 500m apart and completely invisible behind some otherwise impressive swell. I swam quite a way off course at one point, with my Garmin clocking an extra 330m by the time I came out of the water, lost time trying to sight every few strokes and so never really found my rhythm. 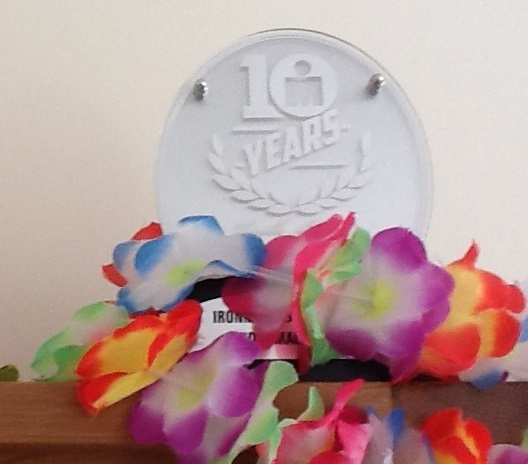 Having hoped to break an hour, I was disappointed to be running back onto the beach in 63 minutes, but quickly dismissed this from my mind – the swim course was also new for 2014, so could have been short, could have been long, and in any case, what would be the point in worrying about it now? 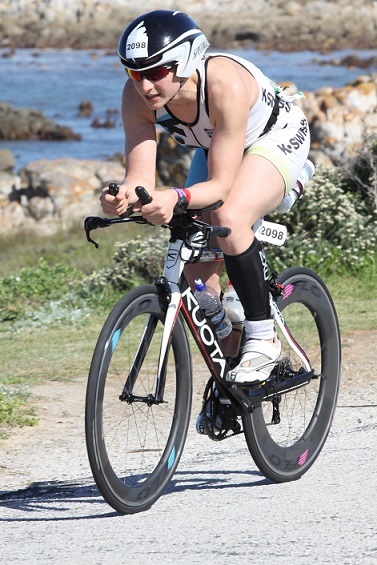 I focused on getting myself through T1 and out onto the bike course as quickly as possible. With all the 25-44-year-old men having started the race 20 minutes before I did, transition was rammed, with men changing on the grass outside the tents as well as in the women’s changing tent! This didn’t bother me… but what did was the massive queue for suncream on the way out. Something I hadn’t planned for, and which required a split-second decision of whether to lose time now, or potentially much more time later. I’d liberally applied factor 50 before the swim. It said “waterproof” on the bottle…. I skipped the queue and ran to my bike, quickly joining the hundreds of people already out on the road. Overtaking from the start, I used the slower cyclists in front of me to work off, hunting down and passing one after another as wide and quickly as possible to avoid any suggestion of drafting. It was A Really Long Way to the first aid station – I think around 25km. Thirsty after the swim and carrying only one water bottle (and one gel bottle, plus a bento box full of goodies on the top tube), I was reliant on a plentiful supply of water from the aid stations to keep myself hydrated. They weren’t well spaced but I drank at every opportunity and felt at the time that it was enough. The bike leg itself was fun. It’s hard not to enjoy yourself when you’re constantly overtaking people! Coming back past transition before the second lap, the atmosphere was amazing. Despite a strong wind I was flying, still passing people and the cheering gave me a welcome lift. I passed the lead female AGer shortly after the start of the second lap – she’d put five minutes into me during the swim and wasn’t messing around on the bike. I wasn’t sure at the time that she was leading, but I knew she’d won the 2013 amateur race and hence that I must be there or thereabouts. I was also pleased to pass one of the pros (who’d started 30 minutes ahead of us) around the middle of the second lap, and to see only one instance of blatant drafting on the course the whole time I was out there. There were plenty of officials on motorbikes doing their best to prevent it, although as ever this made it harder to pass. Towards the end of the bike course the wind really picked up, making it a real grind back into town. Despite the dent this was putting in my average speed I relished it, knowing that I was very strong and very aero (thanks, as always, to Ed here for lending me his equipment, buying me bits of mine that I couldn’t otherwise afford and spending hours making sure it is all in perfect condition to race). I had every confidence that others would be slowed down by the wind more than I would, and the splits I saw later bore this out. 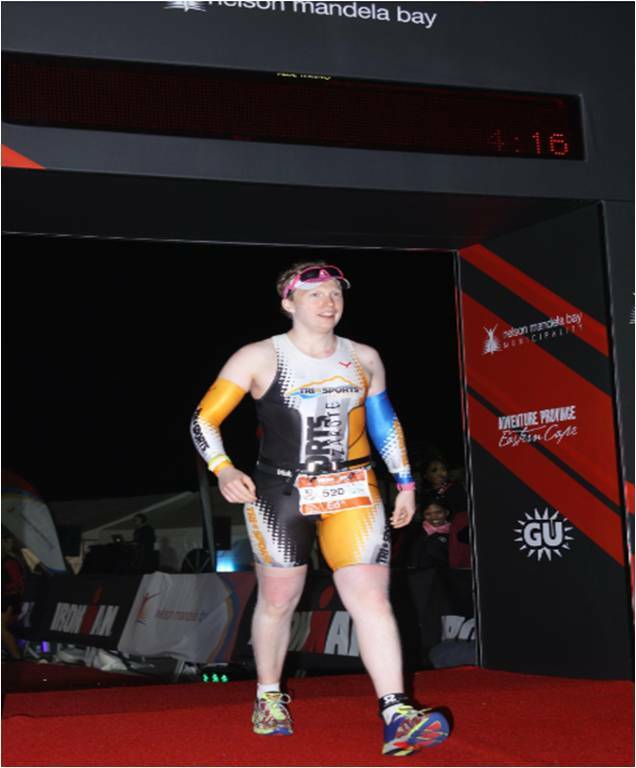 I was through T2 quickly (for me…) and out onto the run, confirming with a volunteer as I replaced my bike shoes with socks and trainers that I was indeed the first amateur woman through T2. Now all I had to do was hold onto it… I did, however, pause for suncream this time, as I’d realised my skin was no longer the same colour it had been that morning. I started running…. and something… just… didn’t…. work. I’d done all my long runs off the bike back home, mainly on off-road, relatively hilly terrain. They felt easy and sustainable and so I was expecting, on race day, on flat tarmac, to be able to hold at least the same pace I had in training. Instead I was almost a minute a mile slower over the whole marathon. I didn’t fade, and I didn’t walk, but found myself unable to run any faster for the duration of the run. I’ve spent the weeks after the race trying to work out what happened. I felt I’d paced the bike well, with a lower average HR than in any previous Ironman and no big surges (with no particularly steep climbs on the course) so the “obvious” answer probably wasn’t the right one. In the end I put it down to heat, sunburn and possibly not getting my nutrition right on the bike, as my stomach didn’t settle down until I’d made 2 stops and reached around the half way point of the marathon. Although I’d obsessively eaten and drunk every 20 minutes on the bike as planned, it’s possible that I had too much, or that I simply couldn’t tolerate the caffeinated gels I was using, even though I’d practised with them in training with no ill effects. The run was otherwise unremarkable. I was lucky that I’d built up enough of a lead on the swim and bike that only two women passed me – I gave each of them a shout of encouragement, which I don’t think either was expecting! I also saw Ed going the other way on my second lap and although by that point I wasn’t able to respond to his shouting, I was as always hugely relieved to know he was safe. Unable to face the thought of eating anything (including gels… in fact, especially gels) I forced down some Coke whenever I could manage, as well as water. I was terrified that I was about to run out of sugar and slow to a walk at any moment, but this point never came – in the medical tent straight after the race they even measured my blood sugar and told me it was fine. One slightly sad and demotivating part of the run course was the part where it rejoined the bike course. This was fine for the first two laps, but during the final lap, on my way to a 10:45 finish, I realised that anyone I saw still on the bike would be pulled from the race as soon as they reached transition, with a 10:30 cut off for finishing the bike leg. I couldn’t dwell on this for long, though: the run course was increasingly full of people, who were now mostly walking, and I combined dodging round them with checking my Garmin and realising the run course was going to be slightly long (grrr), while also worrying about the fact that I hadn’t actually worked out the way to the finish line – I didn’t know how far behind me the next girl was, and I was in any case really very keen not to run past the line and have to retrace my steps! Having been poked, prodded and stretched at least partly back into shape by some brilliant volunteer physios, I was free to go. The athlete info tent in the finish area was excellent: they were able to show me a breakdown of all my split times, as well as telling me where Ed had last gone past a timing mat and hence roughly where he would be now. I worked out that he’d be coming past transition about 20 minutes later, leaving me just enough time to stuff my face with as much pizza and chocolate milk as I could lay my hands on before wandering up towards the road to try and find him – I was overjoyed when I saw him and we even managed a quick hug over the fence before he headed off to walk his final lap (due to injury he’d been advised not to try to run during the race). After taking my bike and bags home, I waddled back a couple of hours later to watch him finish. 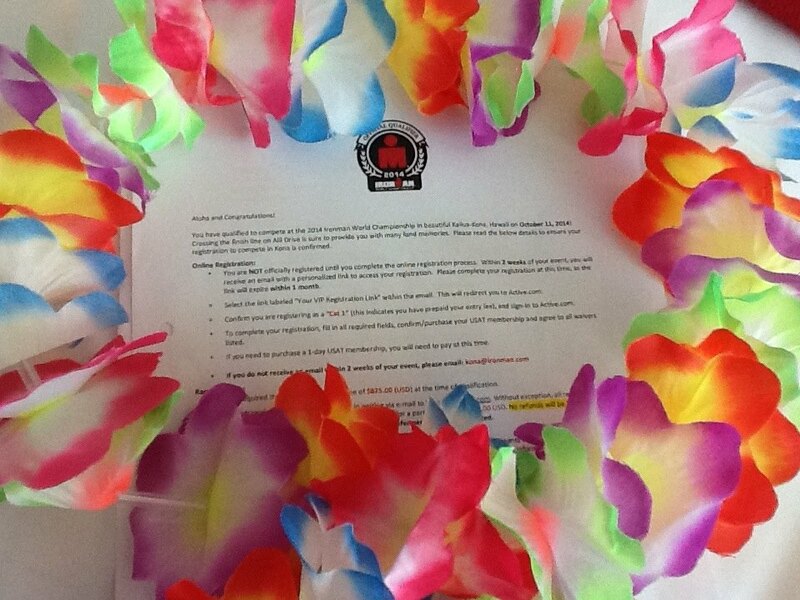 This entry was posted in Uncategorized and tagged award, Bike, heat, Ironman, Kona, KQ, run, South Africa, swim. Bookmark the permalink. I am excited about the Iron Man 2015, South Africa and I expect to see some enthusiastic athletes from all around the world.